Well, that can’t be good, but that’s how the blurb for AMCOG Games‘ latest release begins. That release is Island of the Undead, a brand new game from Tony Bartram that puts you in a fight for your life – against the living dead. 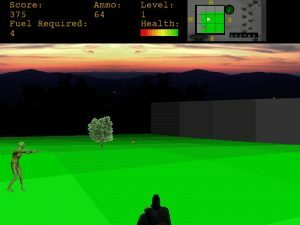 The game is a first person shooter, or FPS, and in the game you find yourself on an abandoned military base, one of several on an island chain, having crash landed your light aircraft due to a fuel leak. While out searching for more fuel, you find a notebook containing the hastily scribbled words of the last person on the island: an experimental virus, designed to extend life, has had not just the opposite effect, but a far, far worse one: The test subjects died… and then re-animated. And they are now on the loose and hungry for flesh. You need to find that fuel and get it back to your plane as quickly as possible, so you can get off the island before you become one of the undead. 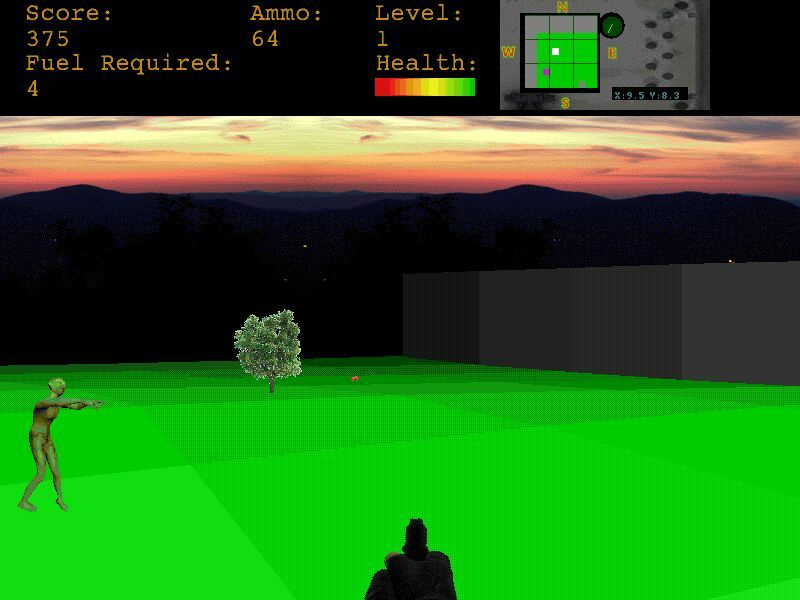 With an early version released at Wakefield in April, the game has received extensive work and testing in the period since, and has gained a number of features, new level designs, and other improvements. It is now available to buy via !Store for £11.99 – and for those who purchased it at the show, there should be a code in the CD case that you can key into !Store to receive a free update. The game is compatible with both RISC OS 4 (running on VirtualRiscPC on a suitably fast computer – an ordinary RiscPC is probably not going to cut it) and RISC OS 5 on all modern systems RISC OS has been ported to since the BeagleBoard. 3D vector graphics in 800×600 resolution. Level codes, so you can skip straight to the level you have yet to get past. Large detailed sprites with animation cycles. Sound effects supplied via the RDSP sound module. All of the game’s source code is included, and the level designs are in a plain text file for easy manipulation and experimentation. Visitors to the next Wakefield RISC OS Computer Club meeting, which takes place on Wednesday, 6th June, will be able to see Island of the Undead demonstrated, a long with many of the other titles in AMCOG Games’ stable, when Tony Bartram will be attending as the Club’s guest speaker. He is also planning to attend the Freeplay event in Manchester on 16th and 17th September (which covers a lot more than just RISC OS), and the RISC OS London Show on 27th October.